Discontinued - LS1 5.7L without ECM and Wire Harness - A new small-block legend in its own time! When GM dared to release a redesigned small-block in 1997, it succeeded beyond the expectations of enthusiasts around the world. Known as the LS Family V-8 small-block, the first and most popular version is the high-performance LS1—available here as a complete crate engine from GM Performance Parts. In many ways, the LS1 is superior to any small-block that came before it. A deep-skirt, six-bolt-main block, with structural oil pan and other carefully engineered features, helps make the LS1 a strong, smooth running and dependable engine. A highlift camshaft actuating big 2.00/1.55 valves in symmetrical-port cylinder heads helps make it a uncompromised performer. The engine is rated at 350 horsepower and 365 lb.-ft. of torque. The engine includes a GTO-style oil pan, electronic drive-bywire throttle body, intake manifold, exhaust manifolds, fuel rail with injectors, balancer, and 14" automatic transmission flexplate. It makes a great performance engine for your performance vehicle project—just add your wiring and electronics. A handy reference guide is available to help install the engine in older cars with minimal guesswork. Go high-tech with your next project! 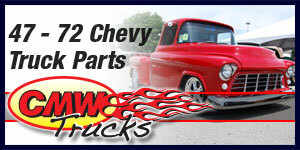 Discover the potential of a fuel-injected small-block Chevy. 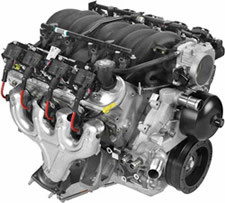 Crate engine kit includes ECM (shown) and wire harness that allows the engine to be installed with a four-speed (4L60 or similar) automatic transmission in a pre-1977 vehicle. 14" automatic transmission flexplate included.